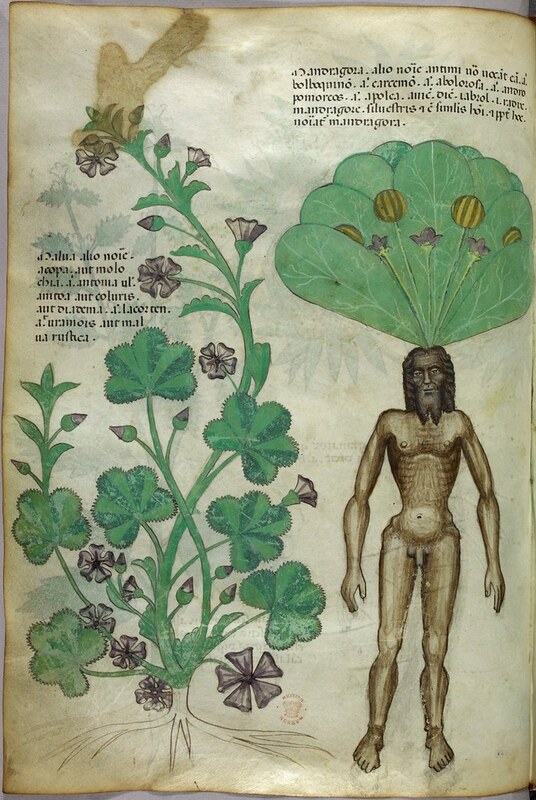 The mandrake plant, where the root is interpreted as a naked man, is from the 1440, ‘Tractatus de Herbis’ seen at the British Museum (Codex Sloane 4016). The bifurcated root was said to resemble a man that when pulled from the earth would shriek, so people believed. Digging to the roots of these words too led to shrieking: some shrieks of amazement, some of frustration. In the making of these videoclips, no students were under the influence of mandrake, a member of the deadly nightshade family. No dogs were harmed! I heard one student say they weren’t too sure whether they liked him or not- “Look at his bragging to Polyphemous, the Cyclops, he certainly was not faithful to Penelope, and look what he did with the suitors and the handmaidens on his return!” And yet –Odysseus’s determination or is it persistence(?) his clever trickery, his focus on returning home and his determined embrace of life and mortality- all this makes him a fascinating character, human and in the end (to this reader) flawed but likeable. We explored various traits that could be applied to Odysseus. Students analysed these words into morphemes, identified the root and the base. Here’s Temira’s initial work carried out with a partner. At this stage she has only copied the dictionary denotation. Later she and the class will write this in their own words to indicate their understanding and in doing so make connections with the root. You will notice letters in red where students marked the letters in the root that have carried on into the present day base element. I felt this was valuable in allowing an understanding to grow between root and base and for students to see how the root influences the orthography. Word, denotation, morphemes and root. Letters in the root that have been carried over into the orthography in the base element are marked. 1.Place words in a category (below) based on your understanding of the denotation (read very carefully) and knowledge of the meaning of the root. 2. 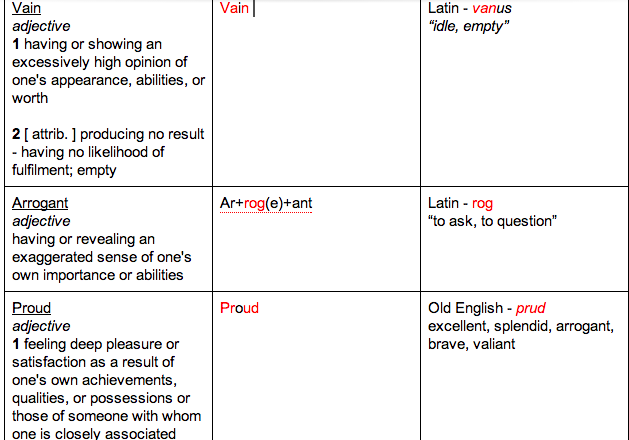 After you have placed these, decide which word of the pair or trio most applies to Odysseus. Make this bold (or change its colour). 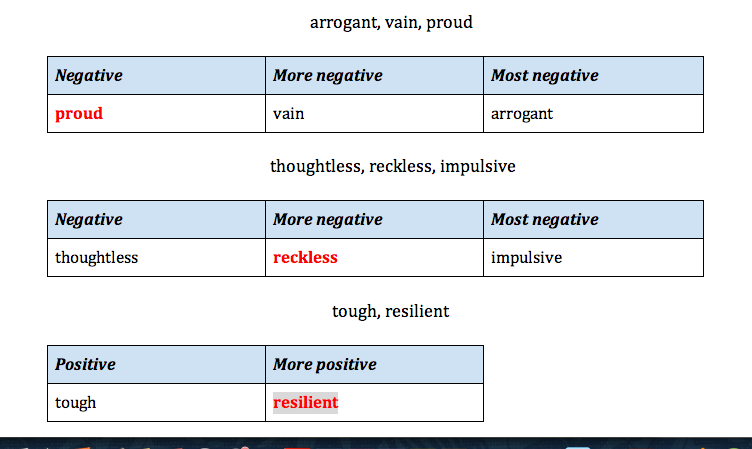 This student has ranked the pairs or trio of words from least to most negative. The words bolded and marked in red are those that the he and his group feel apply most to Odysseus. Phase three had the students placing the words on a continuum from less negative to more negative. This led to a lot of discussion as to subtle differences between words. You’ll note how I attempted, not especially successfully, to push students beyond a simple claim..”I think Odysseus is ..” to begin to justify their reasoning and in doing so reference both the current denotation and the root meaning as well as citing specific evidence from the text to support their claim. Obviously this is a skill we will continue to (and need to) work on all year. Once again these recordings teach me so much about student thinking, both individually and collectively. It, as ever, gives me pause to consider my tendency to steer rather than allow students more time to draw their own conclusions! My mantra after watching these clips below is to : Be more silent! Ask more open ended questions…..! What was gained in this lesson evolving over several sessions? Experience in using references such as Online Etymology Dictionary and the Mac Dictionary to identify the root. It’s not about “rightness” or “wrongness”- it’s about evidence! “If you’d just told me the answer, I wouldn’t have understood. I was uncertain but I needed to slow down and think through and keep asking questions. I needed time and questions”. And I would add not the pressure of getting the answer right. She and I both learned so much from her “wrongness”. 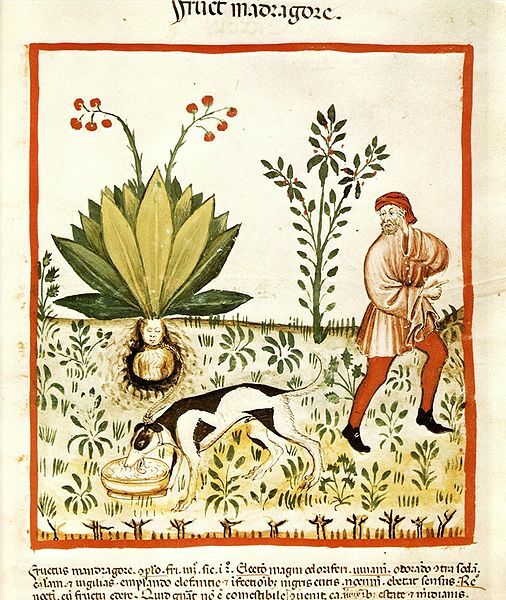 And look at the ‘wrongness’ in the beliefs about the mandrake plant and in the folk etymologizing of ‘mandrake’ as a word.A German belief was that’ the plant springs from the drippings of a man hanged on a gallows. Hence in Germany the plant bears the popular name of the Little Gallows Man. It is, or used to be, believed in that country that when a hereditary thief, born of a family of thieves, or one whose mother stole while he was in her womb, is hanged on a gallows, and his seed or urine falls on the ground, the mandrake or Little Gallows Man sprouts on the spot’! What led to the beliefs that the mandrake shrieked? What does this one word tell us about the time and the culture? Read about Mandrake here. Remember Mandrake the magician? This character, superhero’s powers lie in the hypnotic qualities of his gestures so that his subjects succumb to illusions. Surely an allusion to the narcotic properties of the mandrake plant. Read here and watch here created by Lee Falk (before he created another childhood favorite The Phantom). Note the Falk wrote while Davis worked on the strip until his death in 1964. Falk then organized for Fred Fredericks to illustrate the comics until Falk died in 1999. Fredericks became both writer and artist. The Sunday Mandrake strip ended December 29, 2002.